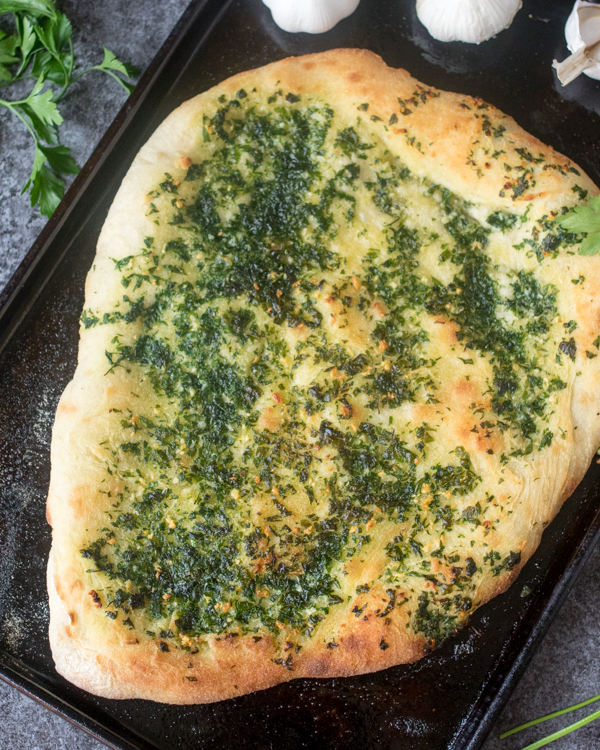 If you’ve never tried making garlic pizza bread at home you’re missing out. 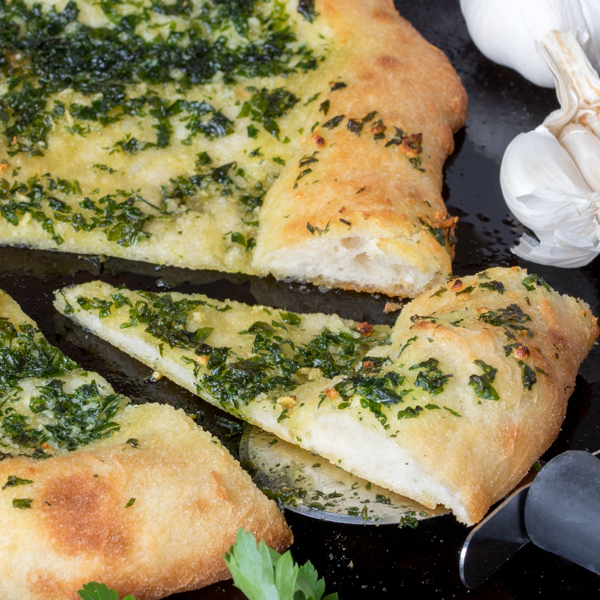 This pizza has a crispy and chewy crust with a simple-but-delicious salty garlic and parsley topping! 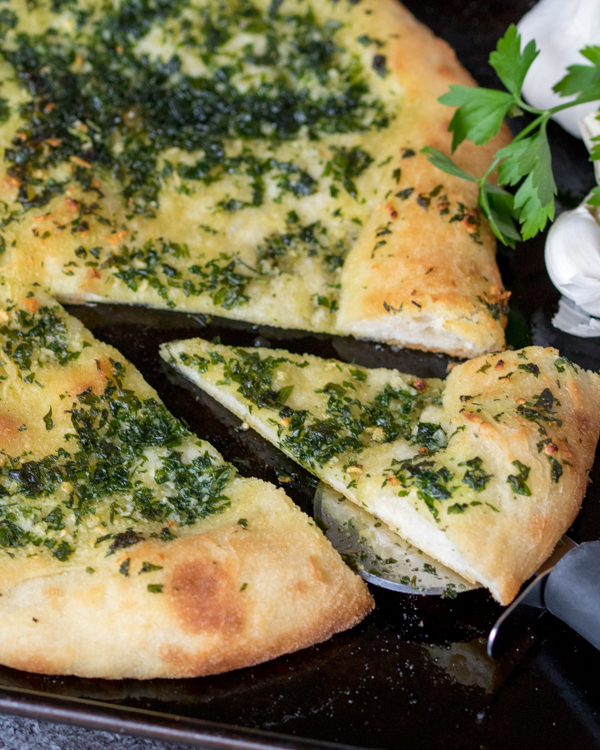 Homemade garlic bread is hands-down the best. You can make it as garlicky and buttery as you like, and even throw on somes extras if you like. Adding mozzarella for some stretchy cheese goodness. Topping the cooked garlic bread with some chopped ripe tomatoes – for a delicious bruschetta feel. Replacing the parsley with chopped cilantro or a mixture of both (this works great served with spicy chicken or a Thai curry). I recommend making the dough for this recipe in a food mixer with a dough hook. The dough is very sticky, which makes it hard to knead by hand. It firms up a little during proving (just one proving stage needed), and at that point you can coat it in some flour to make it easier to work with. I also love to dust the raw pizzas with fine semolina before topping with the garlic butter. This give the finished bread a delicious crispier coating. However, you can just dust with a little more flour if you don’t have any semolina. Place the lukewarm water in a jug or bowl and stir in the yeast and sugar. Leave for 5 minutes until it foams on top. Place the flour and salt in the bowl of a stand mixer. Stir together using the dough hook, then slowly pour in the yeast mixture whilst the mixer is running at a medium speed. Continue to knead with the dough hook for a further 10 minutes, then scrape the mixture into a large oiled bowl (it will be sticky). Cover with plastic wrap and leave in a warm room for 45-60 minutes until doubled in size. Preheat the oven to 400f. Place two large metal baking trays in the oven to heat up. Once the dough has risen, scrape it out onto a well-floured surface. Split the dough into two portions and lightly knead to knock out the air. Form the dough into two balls and let them rest for 5 minutes (you can leave for up to 15 minutes, but cover with plastic wrap if leaving for longer than 5 minutes). Mix together the garlic topping ingredients in a small bowl. After 5 minutes, dust both of the dough balls well with semolina and stretch out to form a rough pizza shape. Take the hot trays out of the oven and spray or brush with a little oil. Place one pizza on each tray (I fold the dough over my arm to move it). Don’t worry if it wrinkles and looks a bit messy on the tray, it will smooth out during cooking. Stretch out a little more once on the tray if needed. Spoon the garlic butter onto the pizza breads and use the back of a spoon or a brush to smooth the butter all over – right up to the edges. Place in the oven and cook for 7-10 minutes until golden brown.